Ava DuVernay, Barry Jenkins, Kerry James Marshall, Riz Ahmed, Colson Whitehead, and others are also featured on the annual list. TIME unveiled their annual list of 100 most influential people on Thursday and many familiar faces made the cut. 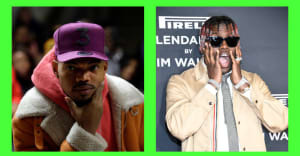 Chance the Rapper is featured on the list and, in his letter of support, fellow Chicago native Common remembered calling the aspiring rapper to offer some advice. "Years ago, my grandmother asked me to call her friend’s grandson. 'I want you to give him some words of encouragement,' she said. 'He wants to be a rapper.' She gave me his number, and I left him a message," Common wrote in his essay about Chance. "I told him to keep following his dreams. Then I forgot all about it." The TIME 100 list also includes Donald Glover, Ava DuVernay, Barry Jenkins, Alicia Keys, Kerry James Marshall, Riz Ahmed, Colson Whitehead, and more. See the full list here.